You are currently browsing the tag archive for the ‘Charles Smith’ tag. Recapturing the magic that transpired a couple weeks ago Thursday was my goal, but realistically, I did not think it would be attainable. For those of you that have not scrolled down to the “Ducks, Lakes and Speakeasies” article allow me to sum it up in a word: awesome! This last Thursday I planned on weaving my Better Burger Bureau group into my wine tastings at Silverlake Wines—a best of both worlds scenario—by first enjoying a burger at The Fix Burger on Hyperion Blvd and then heading to the wine shop to enjoy their pours. Driving eastbound around 4:30 p.m. on Santa Monica was miserable (really anywhere in LA, but the problem is always localized like a blood clot); too much traffic to type into words, but my stomach was a staunch supporter of my architected plans and thus would propel me through the unfathomable slowdowns. In addition to my stomach’s adamancy I had some great music to help me wade through it. 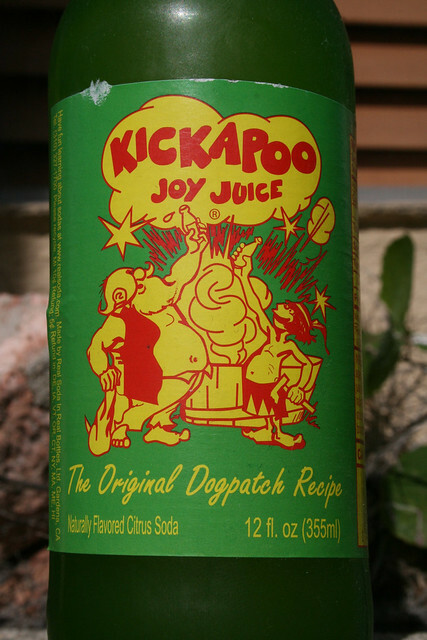 Apparently getting there was only a brief part of my stomach’s problems, I still had to wait for my party to arrive. Meanwhile, I took in the place, observing that it was clean, minimal in decorative touches, a nice looking counter and a few potted plants streamlining the entranceway to really help the feng shui. They were also stocking a cooler with clever beverages, such as Kickapoo Joy Juice and Captain Eli’s Root beer. Trickling in slowly, the first attendee biked in and the rest followed on four wheels. When the group was finally amassed, we took little time to order, almost entirely selecting the “Fix Burger” with slight modifications like changing the patty to bison and one person ordered the “Pesto Burger” and a ton of garlic fries to go round the table. My choice, the Fix Burger with bison arrived first, donning two wedges of tomato, slightly translucent rings of red onion, leafy lettuce, some spread nestled between sesame seed buns. The garlic fries were topped with copious amounts of cooked down toes of garlic. They were very good! I helped myself to the pickles and peppers and began eating, noting that the patty was firm but still revealing a slight pink in the center so it was not over cooked but just a coarse grind. 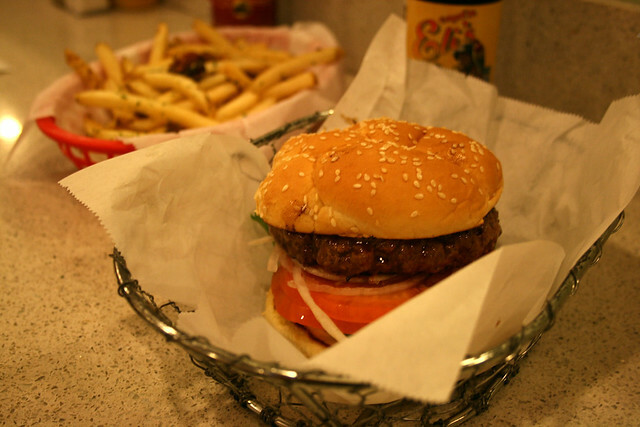 All other elements were satisfactory but nothing special, especially not for the price—a heaping basket of garlic fries, a buffalo burger and root beer will run you the better part of a twenty ($18 after tip). After our burgers we carried on to Silverlake Wine, where there was a slew of activity stirring in the shop, a livelier bunch than I could recall. I spied a head of hair so familiar that I knew we were in the graces of one of the most portentous winemakers of Washington State—Charles Smith. His wines receive enormous scores every year from reputable critics and publications, most recently adding to his acclaim he was dubbed Food & Wine magazine’s Winemaker of the Year. 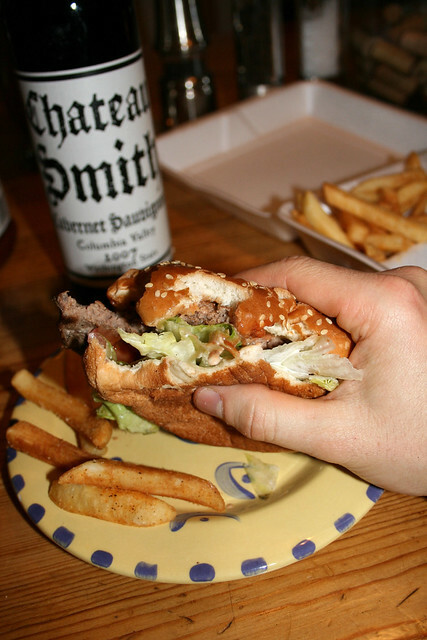 He also has been credited with a hundred point Syrah from his K Vintners label so while other winemakers vie for cracking the 90 point score he has reached the pinnacle of winemaking, lumping him in with some of the greatest winemakers of all time (wow, getting controversial on a burger ‘n wine blog). The man is no slouch. 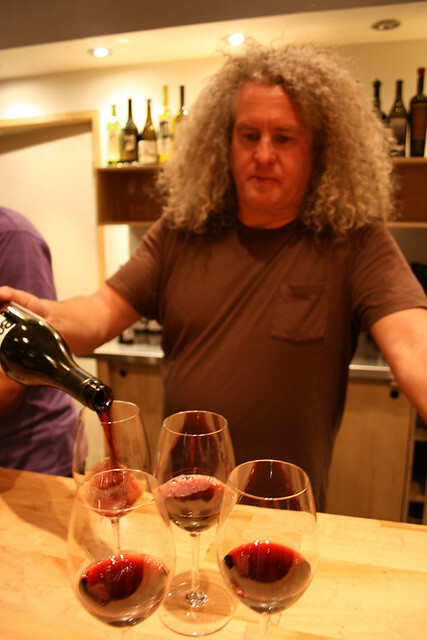 Silverlake Wines would be pouring four of his modest bottles, namely: Kung Fu Girl Riesling, Chateau Smith Cabernet Sauvignon, Boom Boom Syrah and a K Vintners Syrah. I put my tasting book away and just decided to be in the moment. The Riesling was excellent, fresh peaches jumping out of the glass and singing on the palate. It was vibrant, replete with good acidity and was most likely my favorite of the tasting. We then moved on with two bottles I am familiar with the Chateau Smith Cabernet Sauvignon and The Boom Boom Syrah. The Cabernet was not showing as well (that is, it was not as wonderful as I remembered) when I last had the bottle to mark the beginning of the Ducks tumultuous season. The Boom Boom Syrah was noticeably jammy and delicious like a blueberry cobbler but had the potential to be cloying in high volume. Finally, moving on to my first experience tasting a K Vinters Syrah and that was markedly different, trading the blue fruit for savory notes of meat, smoke, earth and a touch of cherry. I was pleasantly full from my burger so the alcohol did not totally rip me apart even though I politely polished off each glass of wine. I spent the day with close friends and was elated (geeked out) to get to meet Charles Smith after seeing him on my favorite wine program (WLTV), and to erase four more bottles of wine from my countdown with his creations, leaving 372 remaining. Thursday is fast becoming my favorite day of the week, not just another in the steady rotation. It was Friday, the season opener for the Anaheim Ducks—it should have been a joyous occasion—and I was interested in watching the game immediately after work. 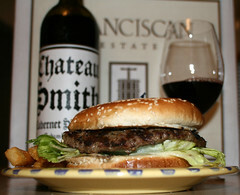 To mark the occasion I was going to have a bottle of Washington Cabernet Sauvignon with a hamburger. I would need to choose a dining spot not five minutes (barring seemingly inexhaustible Los Angeles traffic) from where I currently reside on Santa Monica Blvd to catch the broadcast. Things were getting hurried and jammed. In my sights, the Corner Deli and Grill, an inconspicuous pick, turning out decent fare at low prices, hidden in plain sight to the hundreds of thousands that drive by it in a day, it also fit my search criteria: a short drive from my residence. Operating within a mini-mart, armed with just the necessities to cook: a grill, griddle, counter, a case and few other tools to run the miniature kitchen. I ordered the regular burger ($4.49), an economic deal for a 1/3-pound of “Angus” beef, tomato, lettuce and a considerable spread of mayo, including seasoned fries. No more than five minutes after my order and I was out the door with the Styrofoam carrier in hand, negotiating traffic on Santa Monica Blvd to better my chances of catching the Ducks game. Once home, I got the hockey game primed—already behind two-zero in the first period, the Ducks were making a poor case for a fast start to the beginning of the season—and quickly unscrewed the top to my bottle of Chateau Smith, pouring the garnet liquid into my Riedel stemware, with the hopes of abbreviating the aeration. I gave the Cabernet Sauvignon a few minutes to open up, expecting the brash tannins of its California counterpart, before taking my first swig. In the meantime, I devoured the aromas of the Washington red wine, picking up some cedar, a little black fruit. For some time I had wanted to acquaint my palate with the Washington winemakers, those many who have made significant success with Cabernet Sauvignon, vaunted for their finesse. I was hoping that their acumen would lead to a better encounter with Cabernet Sauvignon (the typical exchange left my wallet hurting and my mouth roughed up). The maker of my bottle, Charles Smith—chief winemaker of K Vintners and Charles Smith wines—is a magnanimous character in the wine world, an important winemaker and practitioner of the grape in Washington. He has drawn lots of attention to the area with his critically acclaimed Syrah (fetching perfect scores from RP). Wines hailing from Washington dwell in a long and cool growing season, unlike the scorching sun that shines mercilessly in some of the more famous AVA’s of California. The cooler climate is similar to the Rhone Valley but Chateau Smith is an elegant and fitting tribute to Bordeaux, blending 96.5% Cabernet Sauvignon with 3.5% Malbec. The burger was huge, the sesame seed bun was soft and warm, the patty was painted with char marks and the first bite showed promise. The texture of the patty was not as tender as the “angus” would generally imply, but it was a good expression of a fast food burger. Then I brought the thin-rimmed glassware to my lips, pairing the bold char flavor with the Cabernet. 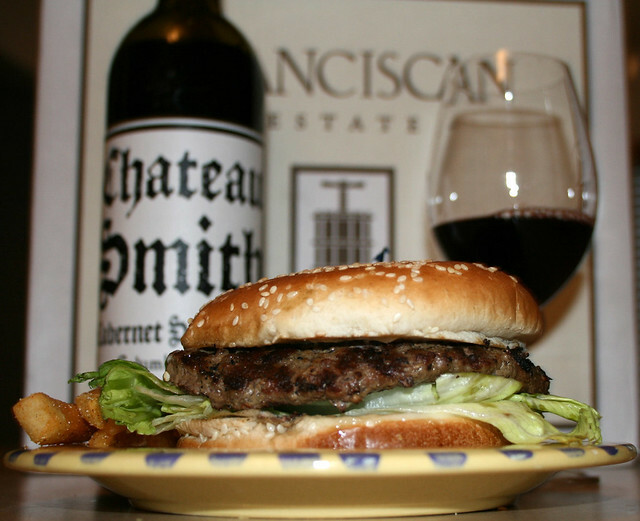 It was a hit; my taste buds were delighted because the weight of the wine (medium-full body) supported the hamburger effortlessly. The Cabernet on its own was very good, soft tannins, low alcohol (relative to the Cabernets to which I am accustomed) and nice persistence of fruit flavors on the finish. The immediacy of the wine was unexpected but its result was instantly gratifying where I might have had to wait the better half of a decade before I could think of enjoying a bottle of Napa Cab. The burger was good (7/10) with respect to the style but the beverage overshadowed it. I enjoyed my first introduction to Washington Red wines via Charles Smith and if only the Ducks had managed to wrest their first victory of the season and had not fallen disgracefully to the Detroit Red Wings (4-0), the night would have been over-the-top outstanding.